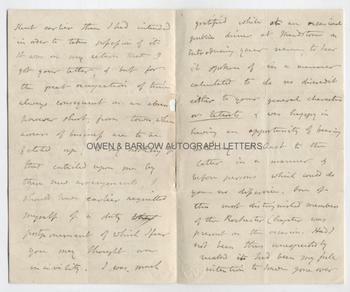 R H BARHAM autograph letter Signed. Thomas Harris Barham also known by his nom de plume Thomas Ingoldsby. British (English) cleric, author and poet. Author of 'The Ingoldsby Legends'. ALS. 4pp. Resid[entiar]y House, Amen Corner, St. Pauls. October 24th 1842. To "My Dear Sir". 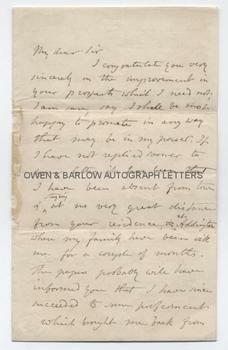 "I congratulate you very sincerely on the improvement in your prospects which I need not, I am sure, say that I will be happy to promote in any way that may be in my power. If I have not replied sooner to your letter it has been that I have been absent from town and staying at no very great distance from your residence, viz, at Addington where my family have been with me for a couple of months. The papers probably will have informed you that I have since succeeded to to some preferment which brought me back from Kent earlier than I had intended in order to take possession of it. It was on my return that I got your letter, and but for the great occupation of time always consequent on absen[ce], however short, from town, when arrears of business are to be fetched up, to say nothing of that entailed upon me by these new arrangements, I should have earlier acquitted myself of a duty postponement of which I fear you may thought an uncivility. I was much gratified while at an occasional public dinner at Maidstone on introducing your name, to hear it spoken of in a manner calculated to do no discredit either to your general character or talents and was happy in having an opportunity of bearing testimony at least to the latter in a manner and before persons which could do you no disservice. One of the most distinguished members of the Rochester Chapter was present on the occasion. Had I not been thus unexpectedly recalled it had been my full intention to have gone over to Rochester to look at the Coverdale Bible in the Cathedral Library and I had actually procured an introduction to the Revd. Mr. Alison [?] the librarian from the Gentleman aluded to. This design is only deferred and I fully intend to run down some day to Gravesend by the Steamer and come on returning the same day - it will give me great pleasure to look in upon you and to assure you that I am very truly yours [etc]." 8vo. Approx 7 x 4.5 inches. Slight mounting damage to fold, resulting in three very small holes to the margin and the loss of two letters from the end of the word 'absence'. All else near fine. 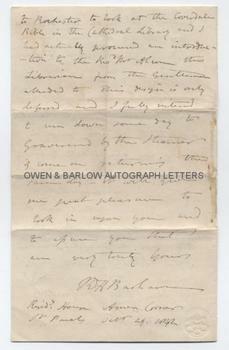 At the date of this letter R H Barham was hard at work on his celebrated Ingoldsby Legends, publication of which had been commenced in 'Bentley's Miscellany' in 1837 and which were issued in three series' in volume form between 1840 and 1847. The 'preferment' referred to in his letter is almost certainly the assistance of his friend, the writer and cleric Sydney Smith, in providing Barham with the Residentiary House at St. Pauls, which R H Barham occupied for the last 6 years of his life.